President Obama made a rare campaign stop in Maryland Sunday afternoon to rally support for Democratic gubernatorial candidate Anthony Brown and to encourage early voting. Marylanders fought heavy traffic, stood in line for hours, and were screened through airport like security before participating in the rally. 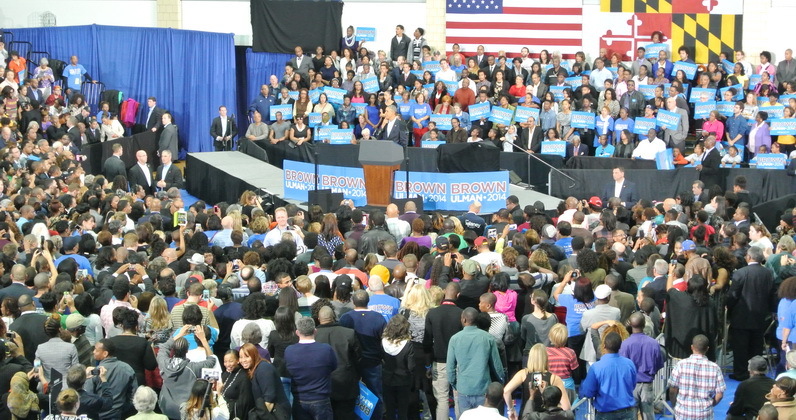 Despite the president’s record low approval levels, thousands of Maryland residents filled the gymnasium of the Dr. Henry A. Wise, Jr. High School in Upper Marlboro. Obama was also stopped mid-speech by a heckler whom the president believed had said “something about immigration reform.” The crowd booed the man that made the comments. “It’s important to have the president here and I think it’s going to get people fired up,” said Jennifer Stapleton, Maryland chapter leader for Moms Demand Action For Gun Sense, an organization created to advocate for child safety against gun violence. Brown’s stance on gun reform and his support of last year’s “Firearm Safety Act” requiring fingerprinting for handgun purchases has been a difference he’s played up against Republican opponent Larry Hogan Jr.
“We have endorsed Lt. Gov. Brown as Maryland’s next Governor,” said Stapleton. President Obama strongly endorsed Brown’s campaign. “Anthony Brown has a new vision, a vision deeply rooted in the American dream… Opportunity for every American is what Anthony Brown believes in,” said Obama, who attended Harvard Law School at the same time as Brown. “Education that helps more young people… If you elect Anthony Brown he will provide high quality pre-k to every Maryland resident,” said the president, touting a key plank in Brown’s platform. “Our students need an earlier start to education if they wish to succeed,” said Jason Fair, a Maryland teacher. Brown, who is campaigning to become Maryland’s first African American governor, was greeted with enthusiasm by the heavily African American crowd, a part of the electorate he needs to win. In a Washington Post poll taken in early October, Brown had the support of 77% of likely African American voters, but 10% were still undecided. Brown urged the crowd to go to the polls. “We don’t have to revisit the struggles and the suffering of the 1950s and the ’60s and generations of history in this country to exercise that most important and fundamental right to vote,” Brown said. “Nothing will change unless you get out and vote,” said Obama. Democrats are worried about poor turnout in the general election after record low turnout of voters in the June primary. The rally energized many who attended. “I think it was very powerful,” Sen. Verna Jones–Rodwell of Baltimore said. UPDATE: Why did they walk out? According to our reporter on the scene, Alexis Webb, it was not clear why a number of people on the crowded gym floor seemed to leave, but it was not an organized departure. They just seemed to drift off. Webb said it was hot and crowded on the floor, and she noticed some of the people left to go up in the bleachers where they could get a better view. Simply walking out doesn’t make a lot of sense, since many people had waited two hours to go through security and then waited another hour for the speeches from various Maryland politicians to begin. It wasn’t until after 5 p.m. that the president actually appeared on stage — four hours or more after many of those attending the rally had arrived at the school or the satellite parking lots. Leaving early to get to their cars didn’t make a lot of sense, since most had to take a bus to get to the satellite lots. If anyone who was actually at the event has a better explanation of what went on and why the people left, we’d like to hear from you. Write to Len@MarylandReporter.com, @lenlazarick or call 410-312-9840. The National Parks Service celebrated its 100th anniversary Thursday, so it seemed like a good time to link back to the travelogue published in June about my three-week, 4,000 mile trek to seven national parks in the west. It’s light reading with more than 20 pictures of what many have called “America’s best idea.” Even if America’s best ideas might actually be found in the Declaration of Independence and the Constitution, establishing national parks was a darn good one too.